The format of the medical record has not changed in a hundred years. Electronic records essentially store data the same way as the old paper chart; unstructured, siloed, and isolated to an individual patient. This structure makes it hard synthesize information contained in the record to support clinical decision making for the patient, in management of groups of patients with similar needs, in the service of medical research, or in support of big data analytics. 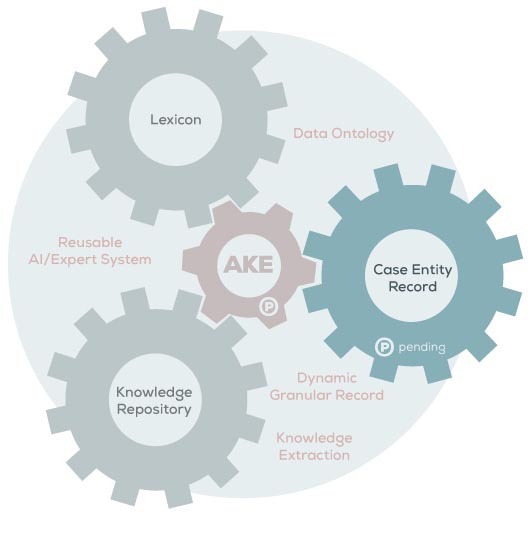 AkēLex uses the same novel case entity structure to store data within the medical record as it does to create knowledge content on diseases. Data collected during a clinical encounter is not just attached to an individual patient, but rather to global case entity structures pertaining to conditions, diseases, procedures, management tracks, etc. These case entity structures represent the aggregate experiences of everyone with this condition absent personal identifiers. In this way, our knowledge of disease can be expanded, lessons learned from one patient can be more easily shared with similar patients, and predictive analytics enhanced by a richer understanding of treatment affects on the natural history of disease.